Summary: Growing up on Forge’s streets has taught Kyra how to stretch a coin. And when that’s not enough, her uncanny ability to scale walls and bypass guards helps her take what she needs. Review: Midnight Thief is an entertaining action/adventure fantasy that delves into unjust power structures and moral dilemmas. Kyra is a compelling heroine, one who grew up in the streets and eventually managed to make her way off of them with her thieving skills. I’m always pleased when a heroine starts off a story competent because it means the reader spends less time watching her level up and more time watching her get to have adventures. While Kyra does have a few training scenes/montages under the Assassin’s Guild—notably in fighting—most of the other characters respect her and her abilities. The skills she had before getting caught up in the guild (both physical and mental) are also the ones that she relies on most during the book. I was a little annoyed that Kyra spent the latter part of the book forced into working for one power or another, but I will admit that the tactics employed were a great way to raise the stakes for her, even if they were predicable for me. Tristam was not as interesting a narrator, but I appreciated that his presence was a good contrast to Kyra. Through him, we got to see the effects of other people’s actions: the Demon Riders, Kyra, and the Assassin’s Guild. He was as his best while he was trying to figure out how the Palace’s intelligence was being leaked and his interactions with Kyra when he still saw her as an enemy. He was clever, persistent, and a skilled manipulator, which are always fun traits in a character. But James was the master manipulator of Midnight Thief. If you like your antagonists as well-intentioned extremists with a liberal helping of the ends-justify-the-means methodology and more than a fair share of terrifying, James will be perfect for you. James wasn’t the only interesting non-point-of-view character; Livia Blackburn populated this world with several standouts, such as Pashla, Malikel, and Flick. Blackburn did a good job of differentiating between Kyra’s and Tristam’s points of view. Some authors might have succumbed to the temptation to give them equal screentime (in order to further the romance), but Midnight Thief is Kyra’s story at heart. Blackburn only jumps to Tristam when there are parts of the story we can only get from him or when he is the better narrator for particular events (the chase in the Palace, for instance). Some of my favorite parts of the book were when Kyra or Tristam were able to question what they were doing, the loyalties they had, the society they lived in, and the repercussions of their actions. I also appreciated that both characters had to deal with death and violence, either that they caused or that they witnessed. Perhaps my greatest complaint about the book is that I felt it contained few big surprises. With a couple exceptions (the one about the Demon Riders, for instance), either my familiarity with certain tropes or the hints dropped by Blackburn meant I often spent several pages just waiting for the book to catch up to my predictions. While it’s fun to guess right every now and then, I wish that I had been blown away more often or hadn’t figured out what direction things were headed so early. Recommendation: Get it soon. 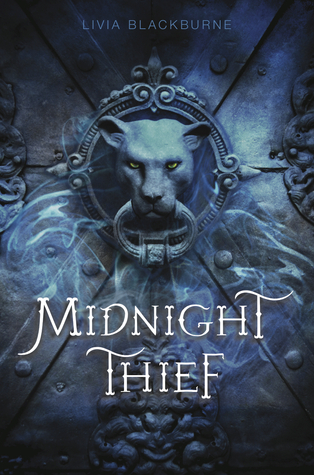 Midnight Thief is a fun, fast read that will appeal to people who like prefer that their fantasy be less like a travelogue and more like a thriller. While I wish the book had felt less episodic and held more surprises than it did, it is a solid debut.